An educational game which provides players an intuitive feel for how a system of n-bodies at fixed electrical potentials interacts within a defined boundary. Players can visualize electrical potential (voltage) as height in the game field. The source code is available on github. A screenshot of the game at the start of a round. To create something which will convey complex concepts of electromagnetism to an uninformed audience. To convey complex information effectively, one must find an explanation that is both simple and elegant. The explanation must also be delivered in a format that will draw the interest of the intended audience. We decided to develop a game which would allow the player to interact with a model of a system through an analogy. We created a game written in MATLAB in which players try to navigate a (magenta) particle towards a destination in the field (green circle around blue dot). The height of the field is analogous to the electrical potential. Charges are at fixed potentials; the remaining field is described by Laplace's equation. Read more about the model here. 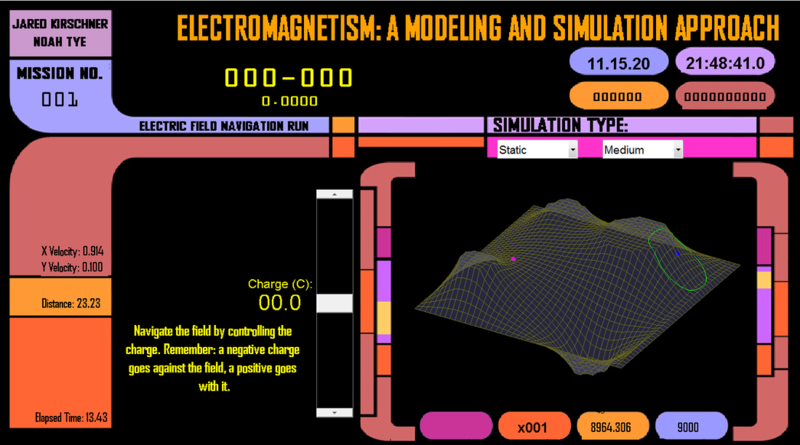 And, yes, we did model the GUI after Star Trek interfaces.